Since the invention of the telescope and its application in astronomy, there has been a continuing strive for ever-larger systems. Bigger telescopes collect more light, and are therefore better able to observe faint objects. They can thus see galaxies, stars, and planets that shine very weakly or that are very far away. 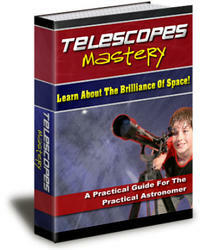 Another important benefit of larger telescopes is that they are able to achieve better angular resolutions. The resolution of a telescope is the minimum angular distance at which two objects can still be seen as individual sources of light; objects separated by an angle smaller than the instrument's angular resolution cannot be resolved. For example, through a small telescope the two components of a double star may appear like one single dot of light, but a large telescope enables distinguishing the two individual stars. The resolution of a telescope is a function of its diameter, or, to be precise, is proportional to the wavelength of the collected radiation divided by the diameter of its primary lens or mirror. The larger the diameter, the better the resolution and thus the better the telescope is able to distinguish individual objects. This is true for any type of telescope, whether it is designed to detect visible light, infrared radiation, radio waves, or any other sort of electromagnetic radiation. Hermann Oberth, the German spaceflight pioneer, proposed as early as 1923 to build giant mirrors using a rotating spacecraft. The spacecraft would deploy several tethers, which would fly outward due to the centrifugal forces caused by the rotation. Astronauts would then interconnect these radial cables with other cables, creating a kind of spider web. To this structure more cables would be attached until a giant, disk-shaped network of cables would be created. In the openings between the cables Oberth intended to place mirror elements, resulting in the creation of a gigantic mirror. He was thinking in terms of a diameter of 150 km (100 miles)—a truly daring idea at a time when the basics of rocketry were still being developed. Oberth's mirror could be used to reflect sunlight to cities or agricultural areas on the night side of Earth. A military use he advertised would be to intensely focus sunlight on one small spot on Earth's surface, creating a sort of "death ray'' to blow up ammunition depots or scorch marching armies. A peaceful application of this feature could be the melting of icebergs that form a hazard to shipping. Oberth also proposed to use his mirrors to improve the climate at the poles by heating them with reflected sunlight, but today's concerns about climate change would not make this a good selling point. The principle of the gigantic mirror could also be used to build enormous telescope mirrors for astronomical purposes, but it would even today be quite a feat to build a large disk structure out of tethers, and also to accurately point such a flexible construction. Instead of increasing the diameter of a single telescope, good resolutions can also be obtained by linking smaller telescopes positioned at a distance from each other. These can be used to simulate a much larger telescope with a diameter equivalent to the distance between the smaller telescopes, called the baseline. The small telescopes cannot collect as much radiation as can a single telescope with a diameter equal to their baseline. Nevertheless, for the objects they are able to see, the combination will have the same angular resolution as the giant telescope they simulate. This technique of combining smaller detectors to attain better resolutions is called "interferometry." Astronomers have long been using interferometry to combine signals from two or more radio telescopes to obtain measurements with better resolutions than could be obtained with individual antenna dishes alone. Recently, terrestrial optical telescope arrays also have been built for scientific research requiring very high resolution images, such as the measurement of the diameters of stars and the search for extrasolar planets. Creating interferometer arrays for visible light frequencies is more difficult than for radio waves, because it requires more precise knowledge and control of the distance between the individual telescopes (due to the shorter wavelength of optical light in comparison to those of radio waves). Astronomy is using telescopes in space because they offer superior observation conditions. Far above Earth's atmosphere, observations are free from disturbances caused by temperature differences in the air (which makes stars twinkle), and all radiation can freely reach the instruments without being blocked or absorbed by various gases. 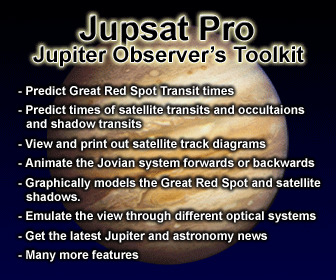 Moreover, without having to cope with the rotation of a planet, in space astronomical objects can be tracked for very long durations. Many astronomical gamma-ray, x-ray, ultraviolet, optical, and infrared observatories have been launched into orbit, of which the Hubble Space Telescope is the most famous example. Scientists now also dream of deploying interferometers in space. NASA's MAXIM (Micro-Arcsecond X-ray Imaging Mission) concept, for example, envisions flying as many as 33 satellites in concert to create a huge x-ray interferometer. MAXIM's resolution should be high enough to image black holes. The European Space Agency is meanwhile working on its Darwin mission, which calls for at least three space telescopes and a fourth spacecraft serving as a communications hub. Operating together, they should be able image to Earth-like planets orbiting other stars. NASA's Terrestrial Planet Finder (TPG) mission concept has more or less the same objectives. Another NASA mission, Submillimeter Probe of the Evolution of Cosmic Structure (SPECS), requires far-infrared/submillimeter telescope satellites to be spaced 1 km (0.6 mile) apart to study the first (and therefore farthest away) galaxies that formed in the early Universe. It should provide an angular resolution comparable to that of the Hubble Space Telescope, which is difficult to reach with a single infrared telescope due to the large wavelength of infrared light in comparison to visible light. Because angular resolution is proportional to the wavelength divided by the telescope diameter, we need a larger telescope to achieve the same angular resolution in infrared as with visible light. However, astronomical interferometry in space is tricky; while Earth offers a firm, solid foundation for the arrays, there is no solid ground in free space. Individual space telescopes could be connected by long and rigid structures, but that quickly leads to unwieldy, extremely massive constructions that are too difficult and expensive to launch, assemble, and maintain in space. On the other hand, interferometers consisting of several free-flying space telescopes require extremely accurate, three-dimensional distance measurement techniques and super-precise active attitude and position control for all spacecraft simultaneously. That is also difficult and expensive to implement, and attitude control thrusters require propellants of which only limited supplies can be taken onboard. Active control using propulsion systems can also disturb the ultra-sensitive instruments and measurements required for many interferometry applications. In addition, thruster exhaust could contaminate sensitive optical equipment and thermally obscure a space telescope's vision. Inspector) satellites. Using tethers instead of propulsive systems simplifies stationkeeping and does not cost any propellant. Moreover, conductive tethers could be used to transfer data and electrical power from one satellite to another. Making the constellation spin results in centrifugal forces that keep the spacecraft at the required distance from one another, while maintaining the necessary tension in the tethers. However, many astronomical interfero-metry applications require that the telescope arrays not spin but rather remain motionless throughout an observation period. Physicist Young Bae has proposed a novel system that relies on lasers and tethers to achieve nanometer distance accuracies in spacecraft constellations spread out over several kilometers. Light being reflected by a mirror results in a minute but measurable amount of thrust (the principle behind the concept of solar sailing), so laser light can be used to generate minute pushing forces. Bae's idea involves laser beams that are reflected back and forth between pairs of spacecraft within a formation. The resulting outward push is balanced by the inward pull of the tension in the tethers linking the satellites. The same laser beams can also be used to very accurately measure the distance between the satellites according to the method of laser ranging; if we measure how long it takes the light to reach another spacecraft and reflect back, and we know the speed of light, then we can determine how far away the other spacecraft is. Any tether has some inherent tension or "springiness," which will try to pull spacecraft together if not compensated for by centrifugal force or laser light propulsion. Varying the intensity of the laser beams, and thus the light thrust, makes it possible to actively maintain the desired distance by balancing the tether tension and the outward push of the lasers. This should enable even more precise formation flying than with tethers alone. NASA is interested in the idea, and its (recently closed) Institute for Advanced Concepts funded the first stage of Bae's laser-tether project. However, there are also other possibilities, such as the use of electromagnets to make individual spacecraft attract or repel each other to control their relative position within a formation. Nevertheless, we have already seen that the deployment of tethers in space can be very tricky. In addition, vibrations in the cables and pendulum motions of the connected spacecraft could cause disturbances in the measurements, potentially making it impossible to reach the extreme accuracies needed for many planned interferometry missions. No space agency will be willing to develop and launch a full-fledged, billion-dollar, tether-based space interferometer system without a thorough proof of the tether formation flying concept. experiments on formation flight control for future tethered interferometers, and specifically for NASA's SPECS mission. They developed and use a laboratory testbed called SPHERES, an acronym for Synchronized Position Hold Engage and Reorient Experimental Satellites. 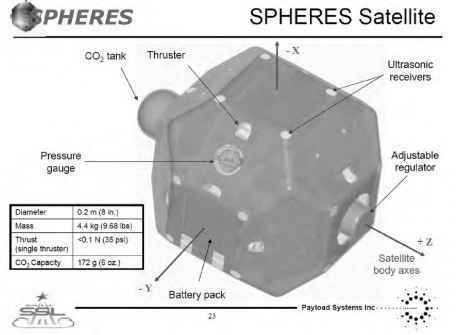 SPHERES consists of a number of autonomous, bowling-ballsized satellite units interconnected by thin wires, a laptop computer acting as the ground station, and some small beacons that the satellites use to determine their position and attitude. The indoor satellites are equipped with cold-gas thruster maneuvering systems that use carbon dioxide as propellant, and strongly resemble the hovering Training Remote used by Luke Skywalker to train his light saber skills in the first Star Wars film. (Fig. 5.2). The system has first been used to simulate two-dimensional tether spacecraft formations on the ground by mounting the SPHERES satellites on air cushions (like on a hovercraft) and putting them on an extremely flat and smooth floor. Levitating on high-pressure air, the units can freely slide across the floor, simulating microgravity conditions in two dimensions. This setup has been used to improve theoretical mathematical modeling of tether satellite formation behavior. SPHERES has also been flown onboard a special NASA airplane that can create microgravity conditions for about 20 seconds at a time by flying parabolic trajectories. This allows tests of three-dimensional formation configurations, albeit for very short durations. Tests inside the ISS, which provides long-duration microgravity conditions, are currently ongoing. The first, single, SPHERES testbed unit for system checks was launched to the station onboard a Progress freighter spacecraft on April 24, 2006. Astronauts commanded it to do a variety of maneuvers and tested the robot's ability to solve problems by blocking one of its thrusters in the ""on'' position. The robot correctly figured out the problem, turned the thruster off, and returned to stationkeeping. The second satellite was delivered to the ISS on Space Shuttle mission STS-121, allowing tests of a two-satellite configuration. A third satellite followed on STS-116, so that tests with three satellite formations could be started. However, tests of formation flying with large distances between individual spacecraft can be done only in free space, outside the space station. Stanford University and Santa Clara University have proposed Emerald, a low-cost mission for the validation of formation-flying technologies, including tethers. It was planned to be launched with the Space Shuttle in 2003. However, apparently no progress has been made on this project; the project's website is currently unavailable, which is usually not a good sign. At the moment neither this mission nor any other similar concept is seriously being financed to fly in the near future. In the meantime, the technology needed to fly interferometer arrays in space without the use of tethers is advancing rapidly, so whether tethers will be competitive in this domain remains to be seen.